When an older adult must move or be transferred, the experience is stressful, but trauma can be minimized with expertise to guide the transition and reduce the disruption caused by change. "Life belongs to the living," said Johann Wolfgang von Goethe, "and he who lives must be prepared for changes." It's a simple wisdom that's often neglected by those who care for elders. For countless older Americans, change is thrust upon them, often with neither consent nor preparation, and the consequences can be dire. There's no getting around it. Change happens. And it doesn't matter who one is—change is hard. That's why moving is tough on everyone. Even when desired, a move from one home to another is always challenging, and one must adjust to new places, faces, and routines. But for elders, especially for those who may have no desire to move or little choice about where they will end up, the experience can be very stressful. Myriad circumstances cause older individuals to be uprooted from their familiar surroundings, and more often than not these are triggered by abrupt and unwelcome developments. A deterioration in health or cognitive status may result in a move from home to a long term care facility or a move to a different level of care within a facility. A fall may necessitate a hospital stay, followed by a move to a rehab and another transfer to a skilled nursing facility. A fire or other natural disaster may cause a facility to close and all residents to be relocated, or a nursing home may shut its doors for a host of reasons. When a move is necessary, the experience may be bewildering at best, and traumatic at worst. But trauma isn't inevitable. When individuals transfer to good facilities and transition expertise has guided the move, distress will be minimized and will ease with time. By advocating for elders and drawing on their core values and competencies, social workers can help ease these potentially fraught transitions and help reduce the stress that so commonly accompanies change. Tracy Greene Mintz, LCSW, is a nationally recognized expert in relocation stress syndrome whose company, Senior Care Training, equips social workers and the entire range of professionals involved in eldercare to prevent relocation stress syndrome, also known as transfer trauma. She characterizes the syndrome as a cluster of symptoms that can occur in anyone who moves from one environment to another, whether a child who has to change schools or an adult who transfers to a new job in a new city. "Transfer refers to the fact that someone has moved from one living environment to another or is temporarily staying in a new environment," says Kim Warchol, OTR/L, founder and president of Dementia Care Specialists, a company that helps improve quality of life for those with dementia and their families by providing professional training and memory care consultation services. "Trauma refers to the severe emotional response to the move." Symptoms of transfer trauma may occur before, during, and for several months after a move and may be mild or severe depending on the individual and the circumstances. Greene Mintz categorizes the cluster of reactions into mood, behavior, and physiological symptoms. Mood symptoms include feeling sad, angry, irritable, depressed, anxious, or tearful. "That's very common, because they don't know what is happening to them," she says. Behavior-related symptoms include combativeness, screaming, complaining, and generally challenging behaviors. They might wander, shut down, withdraw, refuse care, isolate themselves, and refuse to take their medications, Greene Mintz explains. Physiological symptoms include confusion, pain, falling, rapid heartbeat from anxiety, sleeplessness, poor appetite, weight loss or gain, drug seeking, and increased coping through a bad habit such as drinking or smoking, she says. In addition, there may be other physiological complaints such as a sudden onset of irritable bowel syndrome, indigestion, or nausea, adds Tach Branch-Dogans, CRTS, president and CEO of Moving Memories & Mementos, a company that provides senior relocation services. Clients may also call 911, adds Warchol, or make statements such as "I want to go home. Why did they put me here? How do I get out of here?" When a move is initiated suddenly or the change is not welcome, the symptoms, Branch-Dogans says, may be multiplied. If someone breaks a hip, for example, and goes into rehab and realizes they're not going to go back to their own home, the symptoms may be exacerbated. If unaddressed, the consequences of transfer trauma can be severe, potentially resulting in an erosion of cognitive and physical functioning. There's the possibility that the person will elope from the facility and get hurt or lost, explains Warchol, as well as the possibility that behaviors can escalate to the point at which the safety of another resident or a staff member can be compromised. And while studies have been contradictory, some research suggests that elders who relocate may have increased morbidity and mortality, particularly those with dementia. According to Greene Mintz, any time there's a move, there's the potential for transfer trauma. But the risk is greater, she says, for individuals with dementia who can't participate in decision making and have difficulty assimilating new information. "At the core of transfer trauma is fear, loss of control, loss of choice, and lack of the familiar," Warchol says. Those most at risk for transfer trauma, she says, are individuals with Alzheimer's/dementia who move from home into a new long term care community and for those who move within a community from one level of care to another. They often still feel capable of living at home and so resist and have difficulty adjusting to change. "Their insight into their own deficits and needs is impaired, and their belief that they can remain at home safely is strong." In the early stages of dementia and even after, persons with dementia retain strong long-term memory, but, Warchol says, their limitations in short-term memory and new learning memory disrupt their ability to cope with change. If they've lived in their own home their entire lives, she explains, they feel secure and comfortable, and familiarity allows them to have some independence. A move erodes their comfort and confidence. The unknown and the unfamiliar cause fear and anxiety that may remain until they are able to forge new relationships, get better acquainted with a different physical environment, and gradually adjust to change. "Like most behavior expressions in persons with dementia, the response is actually quite 'normal' given the set of circumstances," Warchol says. Therefore, transfer trauma reactions can occur in individuals whether or not they are cognitively challenged, but the degree to which symptoms will occur is likely to be less in those without those challenges. "Because our reasoning and judgment are intact, our ability to understand the reason for the change and thus our reaction to the change may be less dangerous or traumatic." Nonetheless, Branch-Dogans says, symptoms of transfer trauma can even occur in the family members or adult children who are watching or overseeing the transition of an older adult from one location to another, and their reactions need to be addressed as well. Because the fact that this distress can occur in anyone is often unrecognized or acknowledged, older people who do not have dementia may be misdiagnosed, their transfer trauma symptoms being attributed to delirium or dementia when in fact they're simply confused by waking up in a new place that they may not have been involved in choosing. Choice is a significant factor influencing risk of transfer trauma. When a sense of self-determination is diminished, trauma is more likely to occur. "There is sometimes a correlation between the level of agreement to move with the reaction to the move. Those who don't find the move necessary, or those who are adamant about wanting to remain home often take more time to adjust," Warchol says. In addition, says Branch-Dogans, when individuals perceive that they're being bossed around and they have a loss of choice and control, their symptoms may be exacerbated. The nature of the setting can also be an indicator of the degree to which individuals may suffer. "Long term care communities that don't truly deliver person-centered care and those that treat residents more like a disease than a person will see the greatest amount and severity of transfer trauma," Warchol says. "Those that commit 'identity theft'—meaning that they fail to learn or integrate the individuals, their habits, preferences, or routines—will see the most severe transfer trauma because they are thrusting individuals into a world of helplessness and loss of control and autonomy." 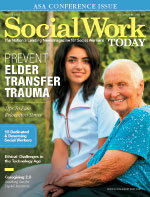 Social workers, by advocating for their elder patients, are key to helping to prevent transfer trauma, Greene Mintz says. Effort should be made to ensure that individuals are not transferred needlessly, or too swiftly. Social workers, she adds, need to advocate for the right placement in the right level of care, involve the patients to the highest degree possible, and devote themselves to whatever they can do to help the client adjust, encouraging the highest possible level of communication among all parties. It's key, she insists, that clients with dementia are placed in settings where people understand dementia care and appreciate the challenges and can help clients navigate a new environment. The only good way to prevent transfer trauma, Greene Mintz explains, is to involve the person in the decision. "That's what I preach over and over in training and case work." When she's called in to a case, she asks who is making the decision to move the individual and what role the client is playing. "The best means of prevention is to slow the process until the actual patient can participate in the decision." And for those individuals who truly are incapable of fully driving decisions concerning transitions, social workers, she says, must ensure that advanced directives are in place and encourage individuals to clearly state to the fullest extent possible what they want and what they do not want. When practical, it may be helpful, Warchol says, to let an individual visit a facility prior to moving in, perhaps inviting them to attend meals or engaging them in activities as part of an adult day care program. "Some facilities offer respite services and this can be a helpful way to help the individual get to know the staff, residents, and facility environment before moving in." In some cases, she says, this can alleviate transfer trauma to a degree. "The long term care communities that discover, honor, and integrate the person's individuality into care will get the best results," Warchol says. Adjustment issues are typically less frequent and less severe when people love where they are living and have been made to feel that they are still the people they have always been." To ease their journey through the adjustment period, "Help new residents establish quality relationships with staff and other residents, reduce their fears and anxiety, provide a sense of purpose and belonging, and honor and reflect who they have always been and still are," Warchol says. It's a team responsibility, suggests Warchol, yet, she says, social workers play a primary role in educating and supporting caregivers. "Families typically respond well to knowing what to expect and believing that they have a person and team that is experienced and skilled in caring for the special needs of persons with dementia." Social workers can also help by connecting clients and families, when appropriate, to senior relocation companies and relocation transition specialists who can help them minimize the disruption and distress that may accompany a transfer. Allowing the distress caused by transfer trauma to go unaddressed, Warchol says, "is unacceptable. When we agree to care for older adults in elder living environments, we are making a commitment to their well-being." Ignoring it, she says, is abuse and neglect. "It should not be tolerated." • Overemphasize welcoming a resident and their family to the community—their home. The entire team should spend time learning the life story of the resident and have a process to pull that life story and their daily routines, meals, and activities and preferences into their day. The more they learn about the person, the stronger they can link their typical routines, habits, and preferences to their day-to-day experiences, hence facilitating a more positive adjustment result. • Work hard to build strong friendships/relationships including those between staff and residents, and between residents and other residents. Find ways to give residents a sense of purpose in the community, whatever that means to them, ensuring it feels like home. • Be careful about language, never using phrases and words we sometimes hear, such as, "You live in a lockdown unit," "Who is working the floor?" or "Who is working with the patient in Room 102, bed A?" None of this language conveys a feeling of home, security, or well-being. • Make sure each resident knows they are valued, responded to, and honored, and that their presence has enriched our day. • Gaining the person's trust and respect are key. Alleviating fear by learning their daily routines, working extra hard to help them build friendships, and enabling them to feel as if they have gained instead of lost will all help them move through the adjustment process more expeditiously and smoothly. • Family members can help by providing staff with information about the residents' lives, habits, preferences, routines, and emotions. • Family members must be considered as well. Families should be advised that some degree of distress is a normal aspect of adjustment, but reassure them that there's a plan in place to minimize the severity and mitigate the impact. They also need to be supported to guard against stress, guilt, and regret about their decisions. • Make clients, family, and staff appreciate that adjustment takes time. It depends on the circumstances, but it takes a minimum of 30 days for an individual to adjust to a new home.